Our friends over at Petopia discovered two new interesting tamable pets for Hunters. Earlier, we wrote about new tamable hunter pets coming in Patch 7.2, but it wasn't until now that players were able to find and tame Lost Spectral Gryphon and Gon. Rikaku from Petopia found out that there's a blue feather sticking out of the nest at the flight master in Stormwind. Clicking on it summons Lost Spectral Gryphon. You can find more details here. Twitter user Mononic1 submitted a screenshot with Gon in Valley of Spirits (Orgrimmar), where Horde players may tame him near Warlock trainers. More information about how to tame him can be found here. 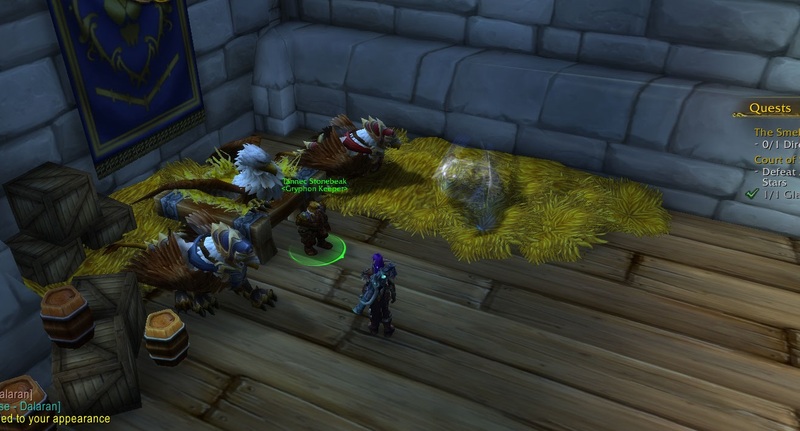 Both factions can tame the pets, so if you're playing Horde and fly to Stormwind, you will have no issues taming the gryphon. Great question. I think it's gryphon for the alliance and the raptor for the Horde, but someone should definitely try out going to Stormwind/Orgrimmar to see if those pets are tamable. You can try asking in the thread at WoW Petopia. There are several people on the wow-petopia forums that have flown out to SW and tamed the gryphon, so I assume that the raptor would be the same way, you just need to fly into Orgrimmar. They are not faction restricted. I tamed the Gryphon on my Orc earlier today.